More and more organizations deploy Veeam as their primary backup and availability solution. Thanks to Veeam Availability suite, they achieve their RTPO™ goals and ensure what is called “Always-On Enterprise”. Now, a scalable and cost-efficient long term archival storage becomes the next big challenge. There are few cloud storage solutions to choose from and even less providing a high level of cost-efficiency. Moreover, going with a single cloud storage provider means putting all data in one basket. Not the best idea in case something goes wrong with the cloud provider’s storage infrastructure. Another challenge is to add a cost-efficient cloud storage pool to the existing Veeam-protected IT infrastructure transparently and make it work as a single product. The existing 3rd party solutions lack comprehensive data management. This means that there is no way to instantly retrieve or even locate a given backup. Furthermore, it can take up to 12 hours to complete a retrieval job from a cold cloud storage tier. StarWind Storage Gateway for Backblaze expands the cloud storage options for Veeam by adding transparent tiering and replication to Backblaze B2 cloud storage. B2 offers unrivaled cost efficiency for a hot cloud storage, allowing you to access your data right when you need it. StarWind Storage Gateway for Backblaze is a Veeam-Ready solution and seamlessly integrates into any existing Veeam-protected IT infrastructure without the need for dedicated software. You can easily manage all your backups using an easy and informative management interface. Recovery is done in just a few clicks: locate the desired backup in the Veeam Console and press “Restore”. 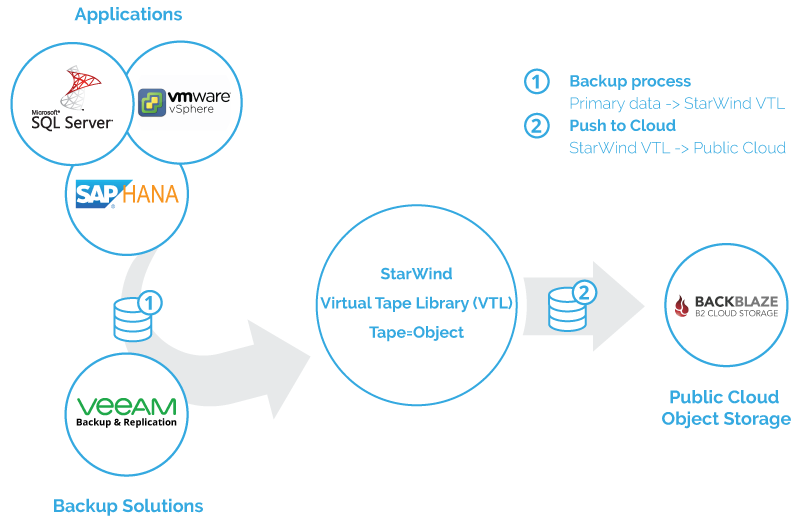 StarWind Storage Gateway will immediately download your backup in a secure virtual tape container from B2 to the local storage and present it to the backup server. Last but not least, data security is improved since StarWind Virtual Tape Library format is ransomware-resilient by design. By adding Backblaze B2 support, StarWind Storage Gateway delivers organizations an archival storage option with unmatched cost efficiency. It also enhances the flexibility of any existing Veeam-based backup infrastructure. What you get is the ability to take your backup infrastructure functionality to an entirely new level. Instant restores, robust and seamless data protection experience, and a cloud storage with unmatched cost efficiency. All that within a single and familiar Veeam management interface.